Salvador Dali, 1904-1989, one of Surrealism's most famous artists in art history, painted one of his famous paintings "Illuminated Pleasures", in 1929, influenced by Yves Tanguy on one hand with its wide-open, deep recession into space, and by another Surrealist, De Chirico, in his use of a picture within a picture. Salvador Dali’s objective in art was, "to materialize the images of concrete irrationality with the most imperialistic fury of precision", to make the unreal seem more real than true reality. Dali built his art on the premise of a paradox; reality combined with the unreality, and lived his life this same way. He was irrational in his behavior, but rational in promoting himself and his art into worldwide fame. Keeping in synchronization with the real-unreal paradox, Dali's color was also discordant with reality. Salvador Dali wrote that he wanted, through automatism, (releasing the expression of the unconscious mind from control of the conscious mind) "to systematize confusion and thus help discredit completely the world of reality". One of his most famous paintings "The persistence of Memory" was painted in 1931. Dali was familiar with Freud's theories written about the subconscious mind. He initiated his paintings one rendering one object, and then another related to the first object, so on, and so on. The Surrealists believed that an artist should not plan his compositions, that a composition should grow out of itself. In Salvador Dali’s painting "The Persistence of Memory", both recognizable and unrecognizable objects are painted. The experience of Dali’s art is heightened by the addition of these objects coming from Dali's unconscious world of dreams, through automatism. The result is shock, as the two worlds do not mix. In this picture there are melted watches possibly signifying the end of time, an amorphous creature lying flat with an eye closed whose time may have elapsed under yet another melted watch, and a tree growing out of a non descript block of static matter. The atmosphere is calm misinterpreting the friction between the incongruous images. Salvador Dali painted "Apparition of Face and Fruit- dish on a Beach" in 1938. In our dreams we experience different things. Some objects we see as a whole, while others may fuse into two realities at the same time. In this painting Dali uses the same system a realist artist uses to paint realistic nature, that is, building requisite forms and colors into a compositional whole. Dali’s images start out as realistic recognizable forms that at some point fuse into a dream world when the image is viewed as portion of the whole composition. The face for example becomes a fruit bowl that becomes the chest and front leg of a dog. 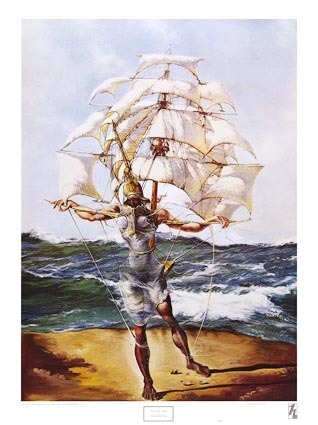 To view the gallery of Salvador Dali paintings click here.